To some, attending a networking event is scarier than being trapped in a room with a clown, covered in spiders, tiptoeing around snakes, all while being suspended over a cliff. While that may sound a bit dramatic, the networking struggle is real for for shy folks. Introverts, rejoice; the Reach Out Strategy isn’t your typical intimidating networking advice. I recently had the pleasure of interviewing Molly Beck, the author of the business book Reach Out. In the book, Beck teaches you how to grow your network to help you land better professional opportunities. 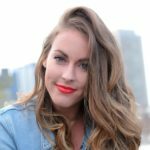 The multi-talented Molly is also the founder of the podcast creation site Messy Bun; the creator of the lifestyle blog Smart, Pretty & Awkward; and a marketing expert who provides digital strategies for companies including Forbes, Venmo, Rice University, and Hearst. Here is what she has to say about her Reach Out Strategy, and her networking advice to all. At a crowded networking event, how do you decide which “huddle” to join and introduce yourself? Look for a group of three – two is too small and they might be having a private conversation, and a group of four or means means you might get lost. With a group of three, you can slide in and they will probably still stop the conversation to let you introduce yourself, but you’re not interrupting a private conversation. When reaching out on LinkedIn, you have limited space (300 characters) to add a note to the connection request. How do you start? What are your thoughts on using emojis in subject lines? I love emojis in the subject line of any email, except one that is directly related to a new job like emailing with a company’s HR team. In other circumstances, it’s a great way to stand out in someone’s inbox – there is even research that businesses that include emojis in the subject line have higher open rates. I’m not sure if that extends to personal email use, but it can’t hurt! LinkedIn is known as the premier professional networking site and is an obvious choice for a platform to use the Reach Out strategy. Do you ever use niche industry professional sites to reach out? If you’re in a profession that has industry-specific professional networking sites, absolutely use them to connect with others in your industry. For me personally, besides LinkedIn, the niche professional site I use is AngelList which is a community for those in the startup space, for my podcast creation company Messy Bun. How do you know if you should reach out to someone on social media? Are you already connected to the Target on social media? Does the Target have over 50 connections on the platform, indicating frequent use? Do you want to highlight something about your social media presence to the Target? Is the Target’s email address hard to find? If the answer is yes to two or more of these questions, I’d use social media to connect with them instead of sending an email. You’re very accomplished in your professional life through your blog and consulting business, but did you ever think you would become a book author? I’m not sure if I thought I would become one – but I certainly hoped I would. When I got the book deal for Reach Out, I felt nervous-overwhelmed-excited. In that order! What’s the toughest question you’ve ever been asked in a job interview? In an interview for an accounting internship during college, the interviewer asked me what the most important job I ever had is. I thought it was a really interesting question for someone at the beginning of their career. I thought about it for a while (well, “a while” in an interview – which is like 6 seconds) and said being a camp counselor was the most important job I ever had – you’re looking after other people’s kids. I remember one mom who would say to her daughter every morning during drop-off, “Just remember, you’re my dream come true.” No Twitter strategy or Google AdWords campaign I’ll ever set up will be someone’s dream come true! Being a camp counselor is still to this day the most responsibility I’ve ever had in a job. What is at the top of your list of things NOT to do when Reaching Out? At the top of my list is: making your message too long (it should be able to be read over a voicemail); attaching your resume in your very first point of contact with them; and giving times you are available to talk without them even agreeing to do a phone call with you first. Are you ready to grow your network? Pick up Molly’s awesome book and let it be your guide for your own Reach Out strategy!